For many people, Winter is the least favorite season. The roads are slippery, dressing up takes longer, and leisurely strolls to the local cafe become a hassle, especially when its 30 below with the windchill. And let's not forget having to put on those winter tires! 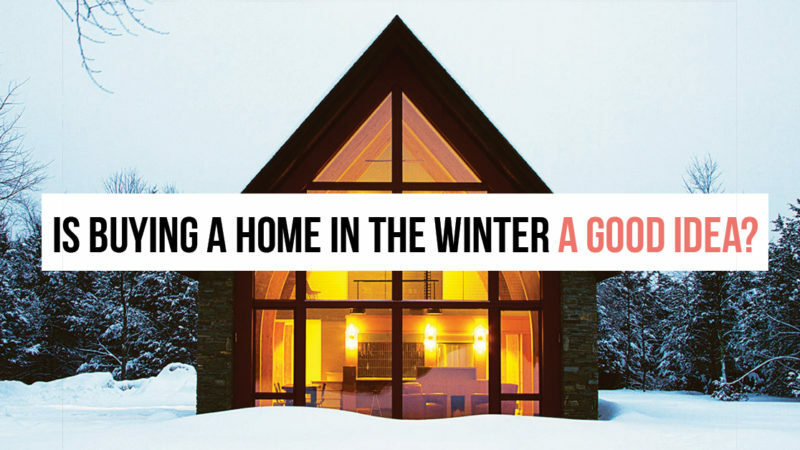 If you're seeking to get a great deal on a home, however, the winter season could be a blessing. During winter, people are less keen on venturing out to search for a home. The poor weather conditions make the entire process more cumbersome. Unsurprisingly, most homes are sold in late spring and throughout the summer. The lull in the market during winter means less competition. With fewer buyers available, homes remain for sale for a much longer period of time, entitling you with a greater variety of options and more time to find your ideal one. In addition, there's a greater likelihood of you being able to purchase a home relatively quickly, as sellers are more willing to accept your offer; they'll be less ambitious with their sale price with fewer buyers competing. Still, home shopping in the winter requires proper planning. Ensure you take the time to schedule viewing of homes, while taking into account all possible contingencies, such as harsh weather conditions and holiday commitments. The same goes for the closing date and moving schedules, which may require more time and effort. Because sellers generally don't wish to have their homes listed on the market for too long, you'll be able to exercise greater bargaining power when it comes to price and other concessions. During the winter, it's normally the buyers who dominate. In the summer, when many buyers are competing, it's to the benefit of the seller, as they can take their time to wait for the right buyer. However, remember to always be respectful and never lowball your offer. You don't want to offend the seller and lose the opportunity to have them be open to a mutually beneficial negotiation. Never assume all sellers are desperate to sell during the winter. Ensure you do some research on the trend of home prices in your area. It's also wise to keep on an eye on your finances. Don't get seriously into debt to the point your debt-to-income ratio begins looking unattractive to lenders. Even though the winter months are more buyer-friendly, there is no guarantee that you'll receive a sizable discount on the price of the home you purchase, so don't go on a spending spree with your arsenal of credit cards. With the purchase of a new home, you'll undoubtedly have to defer your authority to a variety of professionals: lawyers, home inspectors, moving companies, realtors, and others. Because the demand for the services of these professionals is much lower during the winter months, their fees will generally be much lower. Also, with fewer clients filling up their schedules, they'll have much more time to dedicate to you and your move, offering you greater flexibility and convenience. Don't assume that things can't go wrong, however. Winter brings with it problems that don't present themselves during the summer. Any significant repairs to the new home can potentially be delayed, as they cannot be completed during periods of heavy snowfall or low temperatures. Always be on the safe side and add some buffer time for the closing date of your new home - you don't want any unexpected surprises, especially when the weather is not cooperating. Read more about Edmonton and its growing communities.